In the final part of my Photographing Morocco series I show you Casablanca and Fes. Casablanca was our first stop after Essaouira – just a layover on our way to Fes. And I have to be honest here: Casablanca is not the most beautiful city. For Moroccan standards it’s a bit boring, without the charm we found in Marrakech and Essaouira. But that’s just my very superficial impression, which I got from only one day in the city. Yet Casablanca is still worth staying for one night. 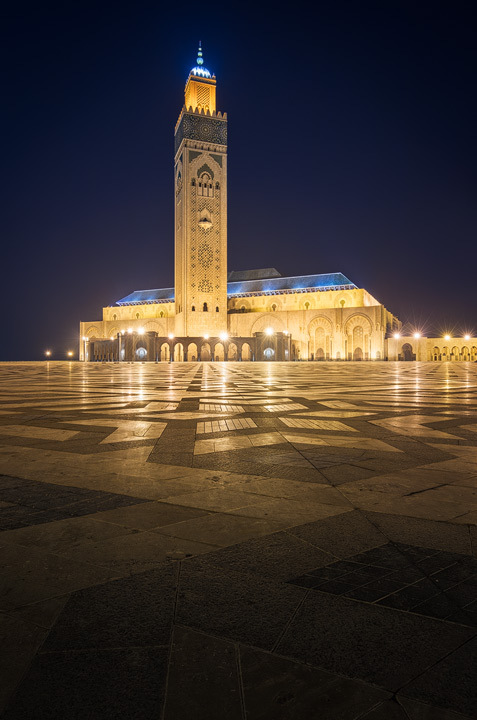 And that’s because of the Hassan II Mosque. This building was the reason I wanted to visit Casablanca and it’s very impressive. Even without a spectacular sunrise I was able to come away with a portfolio photo, just because of the intricate architecture and the dimensions of the building. As I explain in the video below, if you want to photograph it, you should do so in the morning when there are nearly no people around. Due to the security you have to be a bit secretive with your tripod, if you plan to photograph from the plaza as I did. There are other photo spots though, which are to the east and west of the mosque along the coast. Those offer dramatic views with the sea in the foreground. After my photo shoot and a guided tour of the interior of the mosque we took the train from Casa Voyageurs to Fes. If you want to travel through the northern part of Morocco, the train is a very good option. Normally it is sufficient to buy tickets a few days in advance. But I wanted to be on the safe side with my planning and book the tickets before our travels. Yet unfortunately foreign credit cards were not supported by ONCF. The solution was going through a third party, in our case Marrakech Tickets. In the end we payed a bit more, but it was still quite affordable. I also found their service and the communication very good. In Fes we just had to take a taxi from the train station to Fes al Bali, which is the oldest part of Fes and contains the medina. Our very beautiful hotel* was located just outside the old city wall. 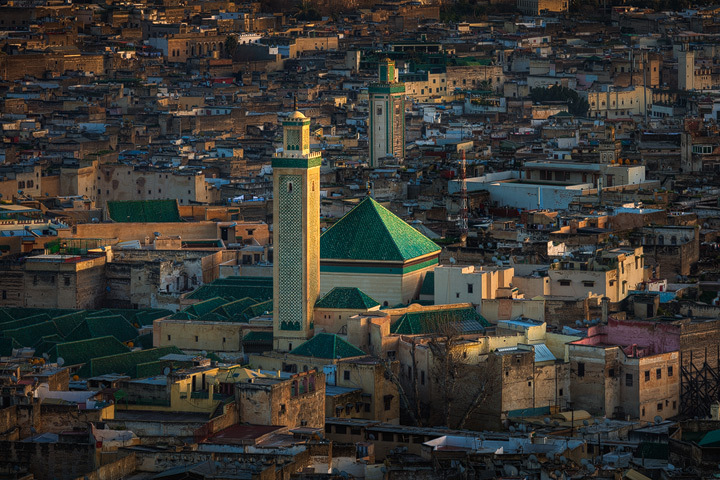 We spent two full days in Fes and explored a lot of the medina, which is a bit like a maze. But to my surprise the GPS of my self-phone worked quite well, so we never got lost. Besides photographing the blue gate, which you saw in the video, I also explored the viewpoints north of the medina. The Marinid Tombs offered a very good view. But while I was up there on the first evening I noticed some ruins a little closer to the city wall. As it turned out those are the best location to photograph sunset. To finish this article and also the series, I want to give some final tips for visiting Fes, because it was different to the other cities we had visited so far. One thing I noticed was that as soon as it got dark in the evening, all tourists vanished from the medina. Only near the blue gate, where you find many restaurants, it remained busy. As we tried to walk through the medina one evening, from the green gate in the east towards the blue gate in the west, we found this a very annoying undertaking. Because, being the only tourists, everybody wanted to show us something, tell us where to go, that this or that way is the wrong one, that this street is closed, that we should come to this restaurant around the corner… You get the picture. From there on we always took a taxi in the evening and avoided the medina. A taxi is just around 15 – 20 dirham from the green to the blue gate, if they use a meter. And here is another tip, which I think you could extend to all cities we visited in Morocco. If you want to get a taxi and it has a meter, this is the cheapest option. If they don’t have a meter, they’ll usually ask for around twice the regular price. You can try to bargain, but often this doesn’t work. Either there’s no other taxi around, so you have no other option. Or all drivers you find in an area have agreed on a price and none of them will offer you a cheaper fare. This is what you’ll experience at the Marrakech train station for example. This can be annoying, if you are on a budget. But I wouldn’t let my travels be ruined by a few additional dollars spent for taxis. Being a taxi driver in Morocco is hard enough I would imagine, so I’d rather try to save money elsewhere. Now, since we are at the end, I hope you found this Morocco series interesting and, if you have additional questions, feel free to leave a comment under my video over at Youtube. I plan to do a little Q&A video soon.